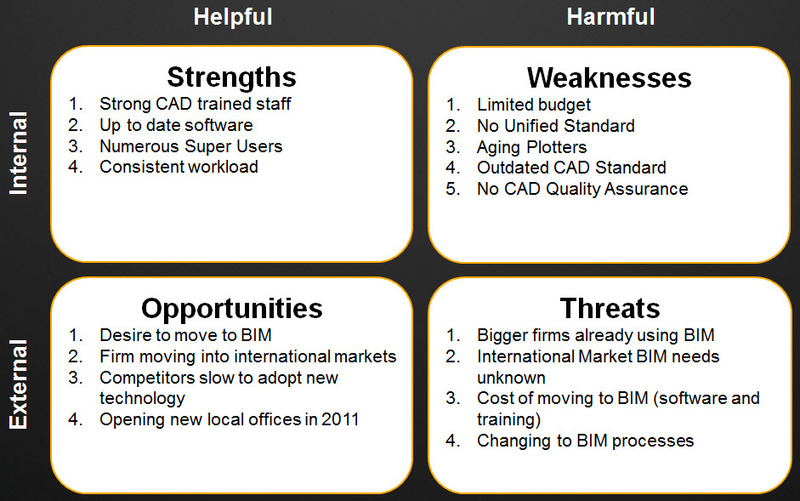 Here is an example SWOT that I put together (very simple) to show you what yours might look like. Each area gets information and there may be complimenting of contradicting statements between the two. You do not fill each one out looking for corresponding issues in the other areas. Just fill out each block with whatever info you have. Reviewing the SWOT diagram shows me that we have trained users and many at the Super User level (Strength). 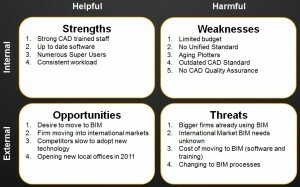 This might help when we transition to BIM as they will embrace the new and I can shift training dollars toward BIM. I also see competitors who are slower to adopt new technology (Opportunity). On the down side – need to address this in the Plan – we have limited budget (Weakness) and a need for greater need to buy and train in new software (Threat). By developing one of these diagrams, you may uncover something that you did not see before. It is all about seeing the big picture.